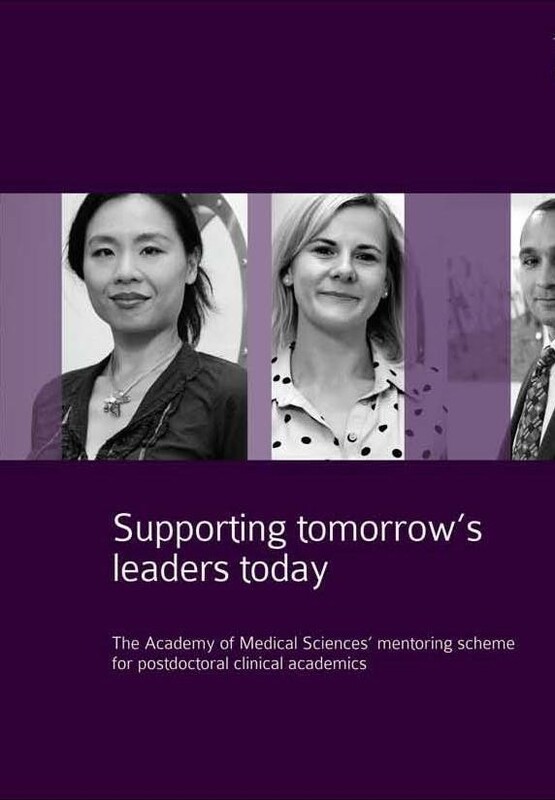 The Academy's one-to-one Mentoring programme provides post-doctoral biomedical and health researchers with career development support by pairing them with an Academy Fellow or senior academic. If you are interested in getting involved in our Mentoring programme, follow the relevant tabs below to learn more about eligibility, the resources available and the support we offer to both mentees and mentors. Additionally, you can read what the mentees and mentors themselves have to say about the programme. We promote an enabling, non-directive approach to help mentees make critical decisions through the developmental model of mentoring. Mentors provide a framework for making career choices and act as a signpost to information and resources. The paperwork associated with the scheme is purposely kept to a minimum, however, the office contacts mentees from time to time to confirm that the relationship is active and working, and to provide support, where necessary. NIHR funded Clinician Scientists, Clinical Lecturers, including locally recognised clinical lecturers, and any other fully NIHR funded medical or dental trainees at post-doctoral level or above, including awards such as PDF, CDF and ACFs who already have a PhD. Clinician Scientist Fellows, post-doctoral research-active Clinical Lecturers, and WCATs. Starter Grants for Clinical Lecturers applicants are invited to participate in the Academy's one-to-one Mentoring programme regardless of the outcome of their application. MRC funded Career Development Award holders, Skills Development Fellows and Programme Leader Track positions. Springboard applicants are invited to participate in the Academy's one-to-one Mentoring programme regardless of the outcome of their application. The Academy’s Mentoring programme is currently only open to post-doctoral researchers. Many universities already have an internal mentoring scheme for Academic Clinical Fellows and we strongly encourage you to make the most of your existing professional network for the necessary career support. To find out more information on starting your own mentoring scheme, visit the mentoring catalysis webpage. Pre-doctoral researchers are welcome to attend many of the Academy’s Career Development events, which feature inspiring talks from Fellows of the Academy and other more senior researchers, networking opportunities and the chance to enhance the ‘soft skills’ that support your research activity. You might also be interested in signing up for our bi-monthly newsletter, which advertises upcoming events, funding calls and other opportunities for early-career researchers, please add your details here. If you would like to find out more about the programme and developmental mentoring, our free Mentoring Masterclasses provide information, training and support for both mentees and mentors. The next Mentoring Masterclass will be held on Wednesday 27th February in Bristol, register to attend this event here. All Academy Fellows are eligible to be mentors. NIHR Senior Investigators and Research Professors, as well as Welsh Senior Research Leaders, can also mentor through our programme. We provide eligible post-doctoral researchers with career development support by pairing them with a senior researcher. Our Fellowship has a healthy mix of clinically trained and non-clinical researchers, who cover a broad range of research disciplines from basic science to highly translational research. Gain insight into the needs of early career researchers. Develop a strong and enjoyable connections with someone new. Have a chance to reflect on their career and give something back to the biomedical and health research community. Experience personal satisfaction in seeing the successes of early career researchers. Prospective mentees are asked to identify a senior researcher they would like the office to approach using the Academy's website. We provide a password for them to login, allowing them to view hundreds of ‘mentor profiles’. These profiles briefly outline the areas of expertise each mentor can offer through mentorship and are a great aid for mentees to identify senior researchers they would like to be matched with. Fellows, NIHR Senior Investigators, NIHR Research Professors or Welsh Senior Research Leaders interested in joining the programme or updating their mentor profile should contact the Academy office. If you are nominating a Fellow to be your mentor, pleasse check the list of Fellows currently opted out of the Mentoring programme. The Academy's Mentoring programme offers a tailored approach to mentor/mentee pairing. The process is led by the mentee, but the Academy's staff are available to help at every stage. Expressing Interest: If you would like to join the Mentoring programme, please contact the Academy office to express your interest. We will send you further information about getting started. Eligibility Check: Part of your initial conversation with us will be checking that you meet the eligibility criteria. If you're not sure if you qualify, please get in touch and we will be happy to talk about your particular circumstances. Choosing a Mentor: After checking your eligibility for the programme, you will be invited to have a look through the online Fellows Directory, which lists details of our 1000+ mentors. You will be sent an automated email with a password to enable you to login to the website and access extra information about our mentors. Sometimes drawing up a shortlist and discussing it with the Academy office, your peers or senior colleagues can help in choosing a mentor as it can seem a difficult task with such an extensive pool of candidates. Once you have chosen who you would like to be your mentor, you will be asked to fill out a nomination form with some information about your research and career, and send it back to the Office. We request that you try to make your selection within three to four weeks. Approaching the mentor: Once you have completed a nomination form, we will approach the mentor on your behalf to ask them formally to be your mentor and explain a bit about the programme. You can also opt for a more informal introduction if you would like to meet them first before deciding if they are a good match for you. Matching: We will get in touch with you as soon as we hear back from the mentor but, unfortunately, sometimes they may decline to be a mentor. This is usually because they are unable to dedicate the proper amount of time to another mentee. If this happens we will be happy to go back to your shortlist and help you identify another person to nominate. Post Matching: After you have been successfully matched with a mentor you will be given information about making the most of your first meeting. As a mentee, you will be responsible for setting up the mentoring meetings. This is a light-touch programme, so you will only be contacted by the Office infrequently to collect feedback. However, we do encourage you to get in touch if you have any questions or concerns at any stage in your mentoring relationship. Developing Your Skills: Mentors, mentees and potential mentees are encouraged to attend the Academy's free Mentoring Masterclasses, which are held throughout the year. These workshops offer practical tips for making the most of your mentoring relationship and are run by an experienced facilitator. The Academy has developed a number of resources to support both mentees and mentors, whilst also providing information about setting up your own mentoring scheme. Our free Mentoring Masterclasses are a chance to hone your mentoring technique discuss the challenges of being an effective mentor or mentee. The workshops are open to all current and potential Academy mentees and mentors. These dedicated mentoring videos include vital information about the programme and how to prepare effectively to get the most out of your mentoring relationship. We recommend that all prospective mentees and mentors watch these vidoes before joining the programme. For those who aren't able to attend our Mentoring Masterclasses, the Academy has held a series of webinars to help increase the accessibility to our resources. If you are interested in starting your own mentoring scheme at your institution, we are happy to help you. Find more information about starting a scheme on the mentoring catalysis web page. The Academy's Mentoring and Career Development Programme has been running for 15 years. It was initiated by substantial core funding from the Department of Health and Social Care, and now the National Institute for Health Research. We have also had support from Health and Care Research Wales, NHS Education for Scotland and Queen's University Belfast to provide support for clinical academics across the UK. Support from the Medical Research Council allows us to extend our programme to non-clinical post-doctoral researchers. The Wellcome Trust, British Heart Foundation, Arthritis Research UK and the Department for Business, Energy and Industrial Strategy are supporting mentoring and training to our applicants and award holders through the Springboard and Starter Grants for Clinical Lecturers schemes. GlaxoSmithKline supports mentoring for academic clinicians in its own university research units.